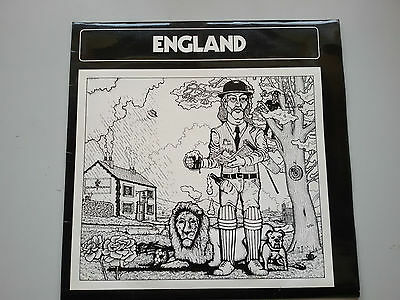 Notes: UK 1st press. Private pressing of just 99 copies making this record incredibly rare. The sleeve is in great shape with only minimal storage wear, no splits, rips or graffiti. The onlydefect of note is a tiny little bit of laminate peel and discolouration on the back where the laminate meets the non-laminated. The disc is also in fantastic condition, it is very clean and shows a only a few very light, faint hairline marks. The labels are imaculate with no signs of spindle trails. I have play tested this and it plays NM. The run in/out and between tracks are silent. No surface noise detected at all. I paid particular attention to the few areas which have the light marks, these marks were found to be totally inaudiable. UK postage is free of charge sent second class by Royal Mail (signed for if over £20.00). Europe (excluding Russia) please add £7.50 for the first item then £1.50 per additional item, rest of the world (including Russia) please add £12.50 then £2.00 per additional item. These prices are only available for items listed as UK free postage and do not apply to any other listings. We package our records in the best available mailers with two cardboard protective stiffeners, great care is taken with all packaging to ensure that your record arrives in the best possible condition. We always aim to post all records within 24 hours of payment recieved, excluding weekends. Claims for non delivery must be made within 30 days of the dispatch date so to give us enough time to investigate and make a claim for missing postage. Our preferred method of payment is via PayPal with the exception pre-arranged collections. Payment is expected within 7 days with the exception of Buy It Now listings with immediate payment. If you are not 100% satisfied with your purchase then please return within 14 days in the same condition as recieved for a full refund, we'll ask you to pay for return postage and please use the packaging in which the item was sent. We don't offer partial refunds. Near Mint (NM) A nearly perfect record. The record should show no obvious signs of wear. The record should have no more than the most minor defects, such as almost invisible ring wear or other signs of slight handling. The cover should have no creases, folds, seam splits or other noticeable similar defects. No cut-out holes, either. And of course, the same should be true of any other inserts, such as posters, lyric sleeves and the like. Basically, an LP in near mint condition looks as if you just got it home from a new record store and removed the shrink wrap. Excellent (EX) An excellent record will show some signs that it was played and otherwise handled by a previous owner who took good care of it. Record surfaces may show some signs of wear and may have slight scuffs or very light scratches that don't affect one's listening experiences. Slight warps that do not affect the sound are "OK". The label may have some ring wear or discolouration, but it should be barely noticeable. The center hole will not have been misshapen by repeated play. Picture sleeves and LP inner sleeves will have some slight wear, lightly turned up corners, or a slight seam split. An LP cover may have slight signs of wear also and may be marred by a cut-out hole, indentation or corner indicating it was taken out of print and sold at a discount.